As everyone should know by now, the spectacular Royal Wedding took place this morning. 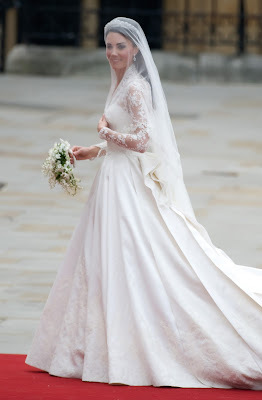 As some obsessed over flowers and vows, all of us fashion lovers just wanted to see how amazing Kate Middleton looked in her unknown wedding dress. The dress was kept a secret from the public until she revealed herself this morning at the ceremony. Kate looked absolutely stunning in her white dress designed by Sarah Burton for Alexander McQueen. It's been said that her dress design was inspired by Grace Kelly's wedding dress from 1956. The detailing on the dress was exquisite. The train was nearly 9 feet in length and the dress was made of different types of lace. The details were so important that the workers who were working with the lace were required to wash their hands every 30 minutes to keep the threads immaculate. The needles that were being used were also replaced every three hours in order to keep the points clean and sharp. The dress cost around $47,000. At the big event, it's said that she put extra padding near her hips in order to make her waist look smaller. I love this innovative idea and it definitely looked great. I absolutely loved Kate in this dress. The newlywed looked dazzling and pristine. The lace sleeves made the dress look elegant, while the bodice gave the dress a modern feel. What did you think of Kate's dress? Grace Kelly pictured on the left at her Royal Wedding in 1956. 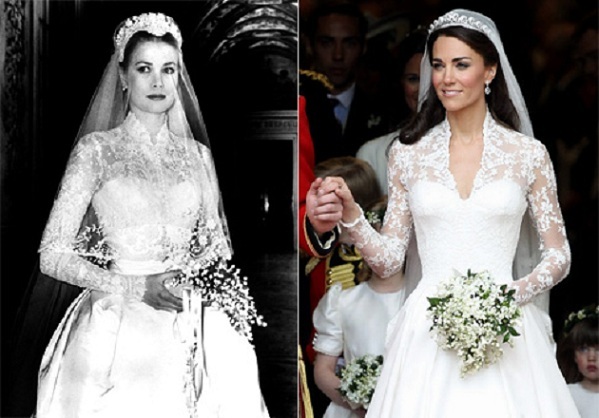 Kate Middleton pictured on the right in a similar stunning design. i don´t really like her style but this dress was amazing! that is really perfect dress ! Thx for Your nice comment! The royal wedding was .. EPIC ! I'm in love with Kate dress, McQueen forever ♥. I love the dress, but Pippa's dress was my favourite ! Check out my new giveaway too. She really looked like Grace Kelly! Thank you so much for your comment on our blog! Very cute blog! Her dress was really very pretty and so super flattering. We hope you stop by again sometime! I adore Grace Kelly she was completely a real princess! I am following you now hope you can follow me too! I'm obsessed with her dress, I loved and! So glad she chose McQueen. It's a river dress! i really same the flag. From vigil the itinerary attendant, it is not unloved to produce those ruffles aligned... the instance ruffles are not utterly human or utterly set either.